Contradictory testimonies from witnesses are drawing the parliamentary probe into the National Intelligence Agency’s alleged election interference further away from a clear conclusion, with only four days remaining until its end. In the hearing on Monday, Kwon Eun-hee ― the police officer who investigated the allegations last year ― said that former Seoul police chief Kim Yong-pan manipulated the investigation to influence the outcome of last year’s presidential election. “(It) was about not filing for a search warrant. (Police officers) had even gone to the (Seoul) Central District Prosecutors’ Office with the necessary documents to request a warrant,” Kwon said regarding the phone call she received from Kim on Dec. 12. Kwon also claimed that her team received requests to reduce the number of keywords used in the search of related online comments, and that the decision to announce the results of the investigation on Dec. 16 was designed to influence the outcome of the election. The NIS officials, however, defended the related actions as being part of counter-North Korean activities. “(The online comments) were response measures to propaganda activities by North Korea and pro-North Korean forces,” said the NIS agent at the center of the allegations, identified by his surname Kim. Last year, Democratic Party officials accused Kim of posting online comments against its candidate Rep. Moon Jae-in. In addition, insults, walkouts, and stubborn demands and denials from the two main political parties have also marred the probe. The morning session of the hearing ended without any of the 26 witnesses being questioned. Instead, the ruling Saenuri Party and the main opposition Democratic Party butted heads over the witnesses being seated behind a screen. Although the two sides had agreed to protect the identities of the NIS employees, DP lawmakers argued that the witnesses would be able to confer with each other behind the screen. The DP also raised issue with Saenuri Party Rep. Kim Moo-sung and Korean Ambassador to China Kwon Young-se being called to the stands, rather than questioning the witnesses present at the hearing. The Saenuri Party refuted the demands saying that the matter has been settled, and then accused the DP of using the issue merely as a negotiating tool. Kim and Kwon served in key posts within President Park Geun-hye’s election campaign, and are accused of having had access to the 2007 inter-Korean summit transcript and using it to damage main opposition candidate Rep. Moon Jae-in’s bid. In arguing their points, lawmakers from both sides resorted to coarse language and insults. 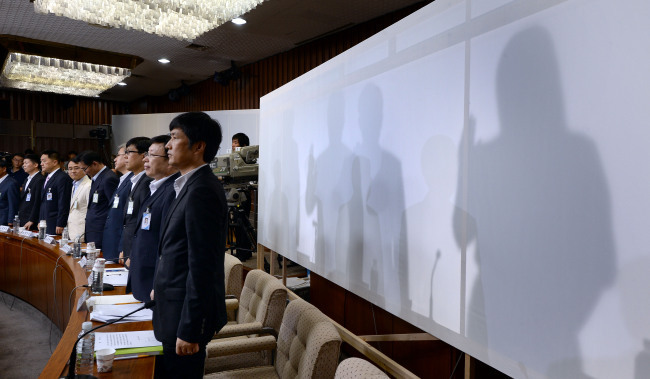 Reps. Jung Cheong-rae and Kweon Seong-dong, respectively the DP and Saenuri Party’s chief negotiators for the probe, began by accusing the other of making false claims. Other attendants joined in on the exchange of shouts, hurling insults ranging from “king of vulgarity” and “irredeemable” at the opposing party’s lawmakers.